Pieces of Advice you have for aspiring writers? Favorite TV show when you were younger? What would we find if we looked under your bed? What advice could I give them? I'm not a writer so I don't know much about this but I want to write a book and I've thought about it writing everything first the way it comes at the moment. When everything is finished I want to read as if I was reading someone else's book and make the changes. I guess you can send it later to your editor but did you like how it came out? I'm guessing Boy Meets World or younger Rugrats. Probably nothing, but if you did find something it would probably be a plastic bag. LOVED Boy Meets World when I was younger..can't wait for the spin-off show! I know! I can't wait for it either, seeing Cory and Topanga as a married couple, I like seeing how their lives turned out, they should do this with other shows as well. Good job in keeping nothing under your bed. 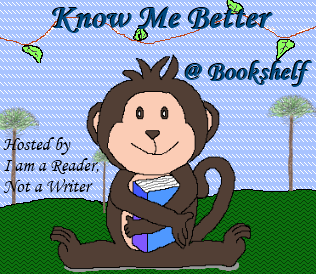 btw how did you change your "I'm a member of book blogs" color and icon pic? Thanks for coming and following!